one-to-one or group tutorials for those studying Data Analysis at an MBA level or students undertaking first-year university statistics. While I enjoy the theoretical and formulaic side of statistics, I accept most people think of the discipline as “sadistics” (just as many regards mathematics as “masochistics”). 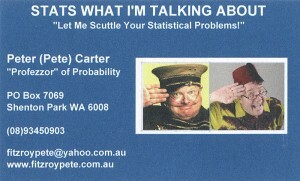 My extensive teaching experience at four Australian tertiary institutions has assisted me in pitching statistics at the appropriate level for different groups, whether in seminar, written report or teaching mode. In this “computer age”, stats are far more available to the average punter. One only has to look at cricket and football (AFL) telecasts to see how rapidly statistics’ profile has escalated in recent years. As such, people really only need to know what various data values mean and not how they’re calculated. On some occasions, you may just want a series of graphs and tables to succinctly display data. The old cliché “a picture is worth a thousand words” rings true. On other occasions, you may require a more detailed analysis of the data, including prediction and forecasting. My journalism, creative writing and teaching backgrounds, combined with years of experience using statistical packages, enable me to prepare “readable” and “user-friendly” reports. At the tertiary level, I believe the best way like to instil confidence in data analysis and statistics students is to highlight practical problems – whether they relate to business, the humanities, science or even sport – and demonstrate how they can be solved using statistics. However, all fees listed above are negotiable. Rather than pay an hourly rate for my services, you may prefer a fixed fee which I can arrange.